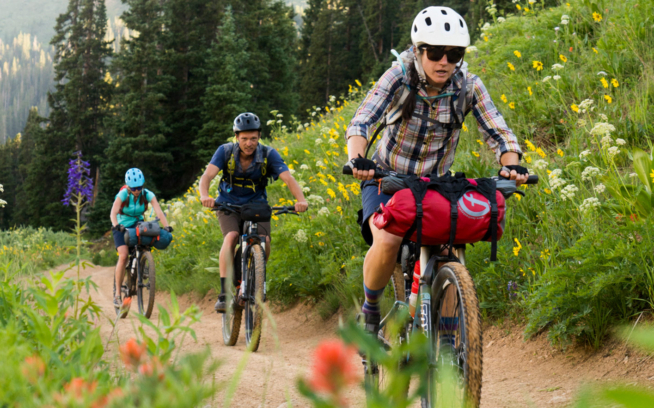 The Continental Divide Trail is not often traveled, and rarely by bike. The sheer remoteness makes access tricky. With this in mind, Scott Rinckenberger, Justin Olsen and I set out for 11 days on our bikes, pedaling northeast from Chief Joseph Pass. We wanted to shed some light on this beautiful area. The second night would be our most luxurious, featuring a backcountry cabin with beds, a table, a fire pit and a chance to wash our gear. Still early in the trip, we had an exuberance that comes from lots of planning and semi-fresh bodies. We had visions of more smooth and cruisy single track, scenic alpine landscapes, meteor showers and a front-row seat for the solar eclipse. In reality it would be much different. When planning this trip out we wanted to compromise as little of the riding experience as possible. The solution was to stage lockable coolers. We would ride two or three days, hit our cache, leave our garbage and load up with enough food to get us to the next drop without a lot of weight. We could also stage a lens or a tripod, or batteries to charge our cameras and phones. If we had a mechanical breakdown on the trail, we were equipped for quick fixes that would last until the next drop. The trail was rugged, rustic and remote. At times it was more efficient to push our bikes and save our legs. When hundreds of burnt, fallen trees were in our way or knee-high grass camouflaged our route, we used the reliefs on our map to find the trail’s general direction. Our backcountry solitude was broken up every so often by a thru-hiker or two. We’d then go another 40 or 50 miles without seeing a soul. Conversations were sometimes just a sentence or two, usually on the topic of grizzly sightings. “No” was, thankfully, always the reply from both parties—our only grizzly sighting occurred before the ride while stashing our food. With tired legs we would go our separate ways. They had miles to gain and so did we. By day four or five we hit our stride. We found the most efficient way to pack our bags and we each had our own tasks when we pulled into camp. Boiled down, your needs become simple: eat food, find water, rest your body. On our final day, with sweat- and dust-stained shirts, we laughed at the value we placed on washing our clothes nine days earlier at the cabin. This simplicity is what we were looking for the whole time. The irony, of course, is the biggest draw of trails like this is also what places them at risk. They provide the simplicity and solitude that we seek, but lack the voices and resources necessary to keep them open to the public. There is a balance to it all. Conservation doesn’t have to mean never setting foot on something. 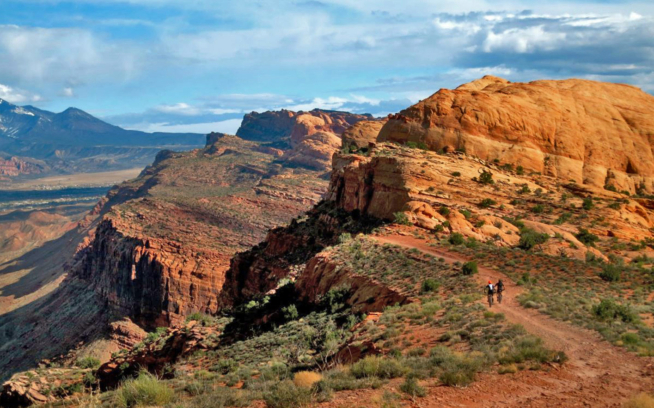 It can simply come from using trails in a respectful manner, encouraging others to do the same and using your voice to protect these remote and incredible places. This story first appeared at evo.com.